San Diego Zoo Safari Park veterinary staff are spearheading a program focused on the health of thick-billed parrots in the wild. Working with our partners, we conduct health evaluations along with nest monitoring activities in the pine forests of northern Mexico. Ectoparasite infestations of chicks and nest cavities are a significant health threat. In response, we have designed treatment protocols for parrots and nests to reduce the devastating impact of infestation. 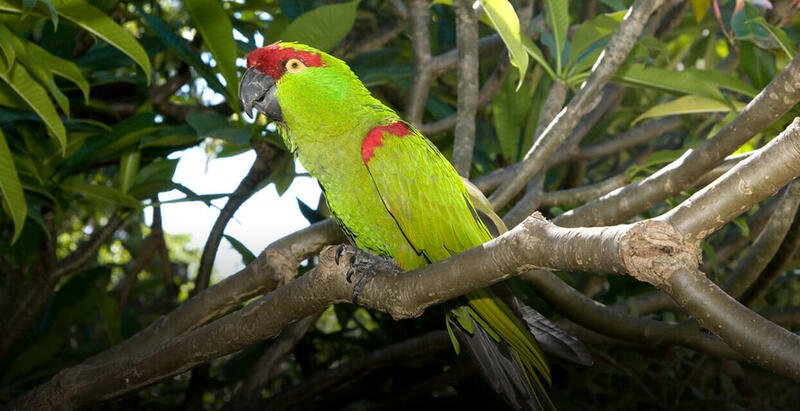 Our partners are analyzing biological samples collected from wild parrots using advanced molecular diagnostic techniques to identify viruses that may impact parrot populations already threatened by climate change. Our Spatial Ecology Lab is designing a study using GPS satellite telemetry and 3-D maps, camera traps, and portable weather stations to better define habitat use and climatic conditions. Indiscriminate logging has decimated old growth forests in the Sierra Madre Mountains of Mexico. Thick-billed parrots depend on large-diameter trees for their cavity nests. Providing information on critical habitat will allow decision-makers to balance the needs of this flagship species with the economic needs of the communities relying on timber harvests. Weather stations will improve our understanding of microclimates to better predict food availability, parasite abundance, and disease vectors. As a member of Thick-Billed Parrot Species Survival Plan, the San Diego Zoo and Safari Park maintain a breeding population of thick-billed parrots that is part of an assurance colony if parrots become extinct in the wild. Our collection goals are to support parrot recovery through reproduction and education. In the past, genetic management of the zoo population was hampered, as many individuals had unknown parents, making it difficult to select the most genetically appropriate breeding pairs. An analysis of molecular data from 66 birds in zoos is now being successfully used to guide breeding recommendations, avoid inbreeding, and maximize the genetic health of the population.